You know how it is. Something which at first seems hilarious or cool or interesting suddenly starts to grate on you. Think of certain catchphrase comedians or every single internet meme ever. Chadwick Boseman will always be known as King T’Challa/Black Panther and is thus expected to have the sort of patriotic pride for Wakanda one would expect from a royal superhero. Therefore he must always be on hand to give the Wakandan salute to thrilled fans, no matter how much his arms may be hurting from being crossed too often. Sometimes the 40-year-old actor is more than happy to nerd it up alongside delighted Marvel enthusiasts; beaming into the cameras while showing his allegiance to the vibranium-rich nation. However, sometimes he is just all of us when we have been in the same job for too long, with the tasks becoming meaningless, repetitive and deathly dull. Attending the premiere of Avengers: Infinity War, Chadwick looked comically expressionless – yet very dapper – as he dutifully posed for a pic of him doing the one and only Wakandan salute. His blank, saddened eyes revealed how we all feel when pressured to go on a night out with our many celebrity friends when we would rather be flicking through a takeaway menu on the sofa. Chadwick’s bored expression while standing on the star-studded purple carpet quickly became a meme, sparking the inevitable hashtag #sadwickboseman. Many fans paired the disinterested pic with a much more spirited one of Chadwick in the same pose, long before the duties of being a fictional king crushed his spirit. Wakanda forever vs Wakanda only on Tuesdays. Y’all remember that scene from Shrek 2 where he freaks out when the kid asks him to ‘do the roar’? That’s gonna be Chadwick Boseman next time a photographer gets him to do the Wakanda salute. Chadwick’s Black Panther co-stars Danai Gurira, Letitia Wright and Winston Duke also joined him for what I imagine was a much more fun filled evening than his pained face would suggest. U telling me I have do this 'Wakanda Forever'….Forever? " Y’all remember that scene from Shrek 2 where he freaks out when the kid asks him to “do the roar”? Avengers: Infinity War is Avengers: Infinity War. It’s not Black Panther 1.5. … I feel like we have a strong presence in the movie, but it’s its own thing. 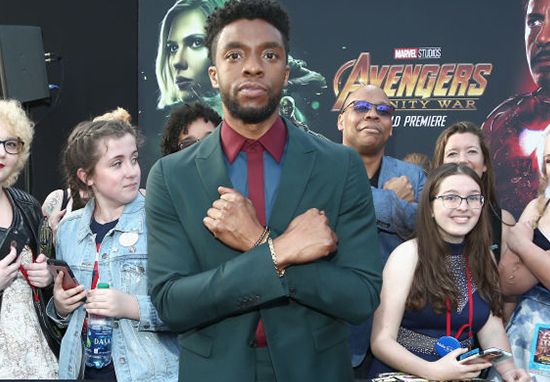 Chadwick Boseman: How long I gotta do this “Wakanda Forever” pose? We all get your momentary lapse of enthusiasm, Chadwick. I personally wore the same expression for weeks back in the days when people kept trying to amaze me with ‘The Dress’ over and over again. Avengers: Infinity War can be watched by non celeb folks in cinemas from April 27 in the US and April 26 in the UK.